WHAT: The Views at Clarendon Corporation will hold a ceremony to commemorate the groundbreaking of the Views at Clarendon. This innovative mixed-use, mixed-income development, located just a half block from the Clarendon Metro station, marks a significant step in addressing Arlington’s affordable housing shortage. Construction is scheduled to commence in November 2009. WHEN: Saturday, October 17th, 2009 from 1:00 to 3:00 p.m.
HOW: RSVP to lmcdonald (at) bozzuto (dot) com. Metro use encouraged; parking available in adjacent garage. ABOUT: The development, located just a half block from the Clarendon Metro station, will consist of eight stories of apartment homes atop two stories housing the site’s existing occupants, the Church at Clarendon and the County’s largest child daycare center. The development will also preserve the church’s steeple – a landmark in Clarendon – and create 120 underground parking spaces. The Class A apartment community will consist of 46 market-rate apartment homes and 70 affordable apartment homes, of which 12 will be supportive housing for very low income households. The residences will be a mix of studios, one-, two- and three-bedroom floor plans. The Views at Clarendon is registered with the U.S. Green Building Council and is expected to achieve at least a LEED Silver certification. The project is being co-developed by Bozzuto Development Company and Chesapeake Community Advisors. Bozzuto Construction Company is the general contractor and Bozzuto Management Company will professionally manage the community. The Arlington Partnership for Affordable Housing has served as consultant to the project since its inception. 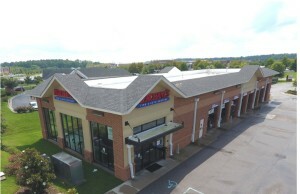 For more information regarding the community and for regular construction updates, please visit www.viewsatclarendon.com .